Below are four pieces of writing related to Don Voisine’s recent exhibition, “R-Value,” at Abaton Garage. In late August Don Voisine emailed an exhibition announcement. I emailed him some observations and questions. I thought his reply was worthy of a broader audience; he also emailed me some images. Finally, Jim Long’s essay from the catalog for this show is included. I thought it would be interesting to gather all of these pieces together in one place to better understand what Don is up to. After putting all of these pieces together, something else occurred to me: in addition to an interest in Don’s work and how it’s discussed, I realized that in gathering all of these pieces the result is a kind of documentation of multiple views of a single thing. There are five views of Don’s work via three different media, public and private:  the press release (email and web);  my observations (email);  Don’s response and explanation (email);  Jim’s essay (published in the catalog, which Don sent me; the essay is not included on the Abaton website); and  the images, removed from the original and disseminated over a network (email and web). A good part of what follow’s is in Don’s (the artist’s) voice, as he describes his process and concerns, and there are three other individuals and/or institutions with something to say: the gallery promoting the show, the writer supporting the work, and a viewer with observations and questions. Being on the opposite coast of Don’s show, I didn’t see it, but I can still engage in it. This demonstrates how over distance this simple technology we’re using (email) helps support a dialog about art; there’s an aspect of the social and community that can help support, articulate, or distribute one’s work, even when we know that the absolute best thing is to see the work itself in person. I think that even more important than uses of technology as a new medium for art, the use of technology like this for extending one’s network and conversation is an important thing for artists to understand. R-Value is a term referring to properties of materials and is applicable in describing soils and aggregates, insulation, and computer science. The R stands for resistance; the value is the capacity of a material to impede heat flow. Increasing values indicate a greater capacity. 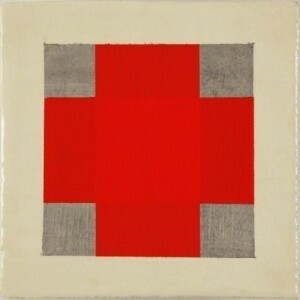 Don Voisine is an artist with a great capacity for abstract geometric painting. He has been practicing this skill for over thirty years, beginning in Maine. Since 1976 he’s lived and worked in New York City, where he exhibits his paintings frequently. He’s also shown extensively in museums and galleries across the United States. Voisine has been a member of the American Abstract Artists since 1997 and in 2004 became president of the esteemed organization. That same year he received an Edward Albee Fellowship. Voisine was recently granted a painting fellowship by the New York Foundation for the Arts. The works in R-Value, which Voisine created specifically for Abaton Garage, are named not only for the insulating abilities of their styrofoam bases but for various race car drivers whose velocity inspired the artist. While speed is not necessarily a quality valued by abstract artists, most would agree that some degree of quickness is important, especially where the intellect is concerned. This work is different than the stuff on Minus Space- from the images, they seem more iconic- does that make sense? Forms that are more kind of sign-like, icons, less spatial. Also, what appears different to me- and this is just based on comparing it to the stuff at MS, since I can’t see your work over a broader period- is that the way you’re building up the paint around the edge into a thick, irregular lip is quite different- it’s a strong contrast with the hard-edged flat forms painted on the surface. It also makes me think of something kind of funny- these are all named after drivers, and the press release talks about speed. While the front of the paintings are hard and smooth- fast- and the foam might be thought of as light and industrial, those thick irregular lips of the paint around the edge make me think of drag and resistance, of something slowing down. That kind of edge slows down my looking. Just an interesting thing to think about- wondering what your thoughts are about that. What is the foam material- is it some kind of building material? Many astute observations gleaned from a few jpegs. I’ll try to answer all your questions. The talk about speed in the press release was the Mark Dagley riffing on that after I told him I was naming the paintings after race car drivers. BTW, my sister works for TRD (Toyota Racing Division in Costa Mesa) and my dad was a used car dealer (died when I was three so I didn’t grow up in a “garage.”). I’ve used different thicknesses of insulation boards, hence the reference to R-Value. Styrofoam insulation has an R-value of 5 for every inch of material. Thus “J-M Fangio R-15” is on a three inch thick slab of foam. “Labonte R-7.5” is on an inch and a half board. I work in oils and paint solvents dissolves Styrofoam. To prevent this I coat the boards with Styro Spray 1000, a two part plastic epoxy used to coat Styrofoam when used to make an outdoor sign or sculpture. I get it from a place in Houston called Industrial Polymers. It’s not too toxic, smells kind of yeasty. I don’t have the equipment to spray this on but you can pour it on and brush or roll it out as well. They say you have 30 minutes of working time once you mix the A & B components together, but I was lucky to get 15 to 20 before it began to set. Working fast to spread out the material is what gives the edges the rounded unevenness and why it runs over the edges. (Jim Long, who writes for the Brooklyn Rail, wrote a short essay and associated the drips over the sides with staples seen on the side of a canvas, anchoring the ground all the way around. I’m paraphrasing.) Aside from the runs, I leave the sides uncoated to show the color of my substrate. I’ve used both the pink and blue versions. I wanted to use some of the yellow foam used in new construction, but that has a ‘greasy’ fiber coating on it and would have taken more time to figure out how to paint on it. Abaton Garage is more of a “project” space, so they like you to show something a little different than you might usually have occasion to. Some painters have shown a video or done an installation, but alas I’m just a painter. I knew about Styro Spray 1000 from a sculptor that had used it for a piece and I’d always been interested in trying something with it. This was my opportunity. These paintings are small, have worked best small so far. The largest I may have in the show will be about 22 inches square. The main reason I can figure out had to do with detail which conveys scale. When I paint on canvas or wood, I apply a wash over my ground and particles of pigment remain in the weave or grain. (That is the part of my paintings where the space is really activated.) This doesn’t happen on these because the ground is so smooth and “toothless” but that lends itself to the hard and fast look of the paintings. Another thing I did was I used joint compound and spackle to make some of the imagery. I’ll send a jpeg of one in a separate e-mail. I liked the observation that you read the painting fast but run into “drag” at the edges, slowing down the eye. I’ll send a disc of images for Matthew to put up on Minus Space, but I think Abaton may put up installation shots when we are done. We’ll start to hang tomorrow. Something stationary. A visual anchor. White, vertical, rectangular. I’m on the Maine coast, after midnight, on a bar of sand that connects a small island to the shore I’m heading toward. There’s only moonlight and a flashlight. Everything is shades of dark grey, no depth or distance; disorienting. The sand and the water look the same. Somewhere near where I set out is a lifeguard’s seat, a tall piece of white. If I can spot it I’ll know where I am. When the sky, water, and land are mixed together the only visual anchor is something that shouldn’t exist – a red square, a yellow stripe, a white rectangle. Abstract isn’t philosophy or aesthetic. It’s a necessity. Painting matters. Don Voisine understands the function of sign and color on a blank expanse of wall. Painting is about moving paint around, but it can get dislocating, flat, like fog or grey night. He works with markers, signals: vertical, horizontal, location, position. Everything in his work is anchored, is an anchor, you just have to find where. The paintings are logical things, non-objectively real, paradoxical. On the sandbar low waves combine from both sides, making dark patches. Water or sand? The flashlight doesn’t show. 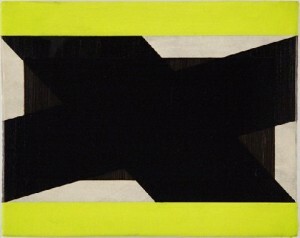 I think about one of Don’s paintings – two grey bands intersect. There’s a shape. Is it real? Is a diagonal horizontal or vertical? 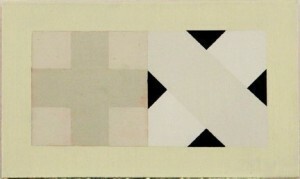 The new paintings offer an opportunity to look again at dimensional combinations of edges as points on a plane. Seeing is a thinking activity. Cezanne found geometry in the landscape. He was thinking abstractly. My eye finds the dim vertical I’m looking for; off-course, to the left. I’ve been thinking non-objectively. Don telephoned to say he was working on a group of paintings on colored Styrofoam insulation panels. My first thought was, “Terrific. It’s about time.” The traditional canvas support was something modernism forgot to get rid of. 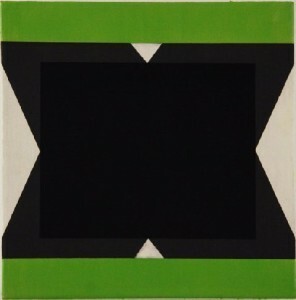 The radicality of non-objective art is that it is highly adaptive, including attaching itself to the stretched canvas “art object.” Don Voisine’s work is primarily planar, ambiguously layered. His forms though often contradictory, are stable without appearing static. Edges are firm, sometimes sharp, and the paint is hard. It’s a format that works elegantly with a colored foam support. 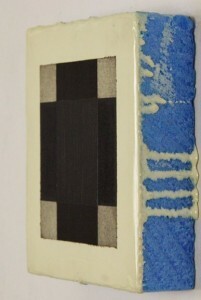 Rigid foam is usually pink or blue. Patrick Henry Bruce colors. The resin is a colorless hydrocarbon once distilled from trees the ancient Greeks called styrax. They used it in perfumes. The color is industrial and deliberate. Voisine applies a gel-coat to harden the surface, allowing just enough of the material to drip down the sides to convey the sense that the ground is tightly anchored all around, the way staples look on the edge of a stretched canvas. He isolates and frames black/grey images with bright color, adjusting it to the color of the support, as well as to the tonality of the image. It’s a tricky move; big league. The color works best when it’s up full volume and acid artificial. Hard ball. Every pitch is different. Voisine nails each one. The colored support adds to the totality of the work as a single concept, yet resists becoming “object.” The foam sits on the wall trying to look modest, but it’s actually sassy and glamorous. I came upon something similar years ago in Italy. A workroom was set up in a churchyard where some 15th century ceiling frescoes were being restored. 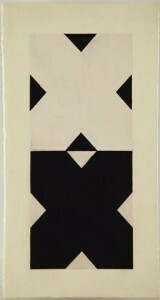 The public was invited to see the painting fragments up close. They had been temporarily mounted on new construction-type wood particle board. The contrast was wonderful. The contradiction looked sensational. The success of Voisine’s new work is its integration of contrasting layers, each presenting “same stuff’ in a different state: image/ground/support – solid/liquid/gas. The paintings exhibit a wide range of feeling. When the work focuses on the unique visual properties of common construction material, like joint compound’s mother-of-pearl sparkle or the delicate skin of vinyl spackle, it achieves a meditative poetry. Snow on stone. Wind-etched ice. Voisine is after a clear, compact statement that embraces maximum effect: combining intense color, black and grey imagery, line and plane, directness and ambiguity. One feels something completely personal in the way he contemplates formal issues. Artists who work with apparently impersonal ideas shoulder an extra burden of interpretation. The step into using unexpected new material references the early days of abstract experimentation, but more insistently locates the work in contemporary painting dialogue.